Fruit, containing natural sugars, pairs wonderfully with a light, delicate crust for a perfect dessert, the fruit pie. 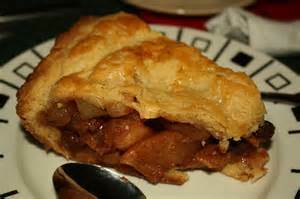 Many pies are loaded with granulated and or brown sugar, which detracts from the healthy side of the fruit, itself. Try a sampling of our healthier fruit pies! The saying is, “As American as apple pie” is more than an expression. Americans love their apple pie and this two crust version will put smiles on everyone’s faces. Instead of granulated sugar, this recipe uses a mixture of apple juice concentrate and maple syrup, both of which add micro-nutrients that granulated sugar does not provide. See Nutritional comparison of maple syrup to granulated sugar. 2 crusts (1 recipe) see recipe here. Peel apples and cut into thin slices. Cook apples in juice concentrate until softened. Mix cornstarch into maple syrup and blend until smooth. Add to the apples and cook until slightly thickened. Remove from heat, mix in cinnamon and nutmeg. Line a pie plate with one crust. Pour in apple filling. Top with second crust. Cut slits in crust to allow steam to escape. Bake in preheated 425F oven for about 45 minutes until crust is lightly browned. **to prevent crust from burning, cover edges with foil for 30 minutes, then remove foil for last 15 minutes. Allow to rest for 15-20 minutes before slicing.